A 22-year-old man from Dagenham was arrested on suspicion of common assault and being drunk on an aircraft after the police were called. 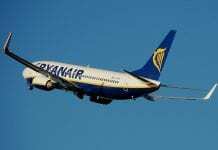 THIS is the moment a drunk passenger is put in a chokehold on a Ryanair flight – sparking cheers from other travellers. The 22-year-old man from Dagenham was arrested on suspicion of common assault and being drunk on an aircraft after the police were called when the flight touched down at Luton Airport at 11pm. The drunk man had been causing problems throughout the two-hour flight, including singing loudly with his headphones on and being a general nuisance to the other passengers on the flight. This was the point for the grey-haired man jumped out of his seat and sprang into action. 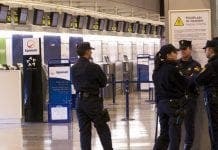 A spokesperson for Bedfordshire Police said: “We were called to attend Luton Airport arrivals at 11pm on June 30 following reports of a passenger acting aggressively on an inbound flight. Where were the cabin crew? The last time I flew with this company the crew were so young and in my opinion lacking experience it made me wonder if their Mothers new where they were!